GLOBAL AWARENESS 101 - Let your VOICE be heard and get involved. OUR future depends on it! : USA: Another Fake Hate Crime; Black Man Has Been Charged In ‘Vote Trump’ Black Church Arson Is Member Of Congregation. USA: Another Fake Hate Crime; Black Man Has Been Charged In ‘Vote Trump’ Black Church Arson Is Member Of Congregation. Andrew McClinton of Leland, Mississippi, was charged with first degree arson of a place of worship, said Warren Strain, spokesman for the Mississippi Department of Public Safety. McClinton is African-American. Strain said McClinton attended the church, CBS affiliate WJTV reports. An investigation continues, but a state official said authorities don’t believe politics was the reason for the fire. “We do not believe it was politically motivated. There may have been some efforts to make it appear politically motivated,” Mississippi Insurance Commissioner Mike Chaney, who is also the state fire marshal, told The Associated Press. Greenville is a Mississippi River port city of about 32,100 people, and about 78 percent of its residents are African-American. While it’s not unusual for people of different racial backgrounds to work and eat lunch together, local residents say the congregations at most churches remain clearly identifiable by race. After the fire, Hopewell congregants began worshipping in a chapel at predominantly white First Baptist Church of Greenville. The Hopewell bishop, Clarence Green, said last month the generosity of First Baptist demonstrates that “unlimited love” transcends social barriers. James Nichols, senior pastor at First Baptist, said the Hopewell members are welcome to stay as long as they need a home. Greenville is in Washington County, a traditional Democratic stronghold in a solidly Republican state. In the Nov. 8 presidential election, Republican Donald Trump easily carried Mississippi, but Democrat Hillary Clinton received more than twice the vote of Trump in Washington County - 11,380 for Clinton to 5,244 for Trump. 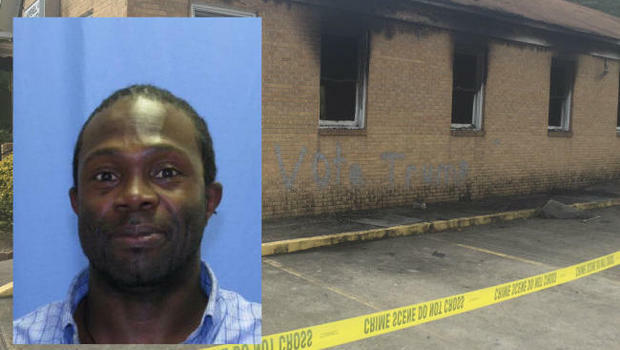 The man who allegedly set fire to a black church in Greenville, Mississippi, and spray-painted it with the words “Vote Trump” is a member of the church. Police arrested Andrew McClinton on Wednesday in conjunction with the arson of Hopewell Missionary Baptist Church, which was burned and vandalized on Nov. 1, a week before Donald Trump was elected president. A bishop from Hopewell told the Associated Press that Mr. McClinton is a member of the predominantly black church. The suspect is charged with first-degree arson of a place of worship. The side of the 111-year-old church was scrawled with the words “Vote Trump” in white spray-paint, prompting calls for Mr. Trump to denounce the act purportedly perpetrated in his name. Writing in the Daily Beast in the aftermath of the arson, journalist Justin Glawe criticized Mr. Trump for failing to denounce the act in his own words, even though the Trump campaign released a statement condemning the arson. “So these are the stakes of this election: a potential president who would not even condemn in his own words terrorism done in his own name,” Mr. Glawe wrote in a piece published on Nov. 6. Several incidents initially reported as hate crimes carried out by Mr. Trump’s supporters have proven to be false. Police charged an 18-year-old student in Louisiana for falsely reporting that she was robbed and had her hijab removed from her head by two white men who yelled racial slurs. One of the men was wearing a Trump hat, she told campus police at the University of Louisiana. The student later admitted that the story was “fabricated,” police said.